The EXIDE 12V 7A charger is a powerful and modern battery charger. 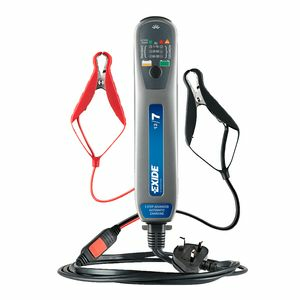 It is a cost-effective charger and ideal for users with high demands on charging of all batteries up to 150 Ah. The EXIDE 12/7 is fully automatic and has a broad range of applications including car, motorcycle, boat, caravan and tractor batteries. Overheating is not an issue as it has a built-in temperature compensator that adjusts the charge power depending on the surrounding temperature. The EXIDE 12V 7A is spark-proof and protected against faulty assembly and battery faults. This charger comes with crocodile and eyelet connectors.